This mold sand-based casting defect occurs with castings of all casting materials which are produced in bentonite-bonded green molds (see Bentonite, Green sand mold). Scabs preferably occur over a larger surface at the top of the casting (mold cavity), but also at the bottom of the mold compartment. Highly compacted sections in the mold are particularly at risk. Scabs are often accompanied by veining (mainly on core sections) and rat tails. All these defects are clearly visible to the human eye, and generally result in rejection of the casting. Scabs (Figures 1 and 2) are irregular metallic crusts on the casting surface caused by scaling; they are only a few millimeters thick, usually have sharp edges and are firmly bonded to the casting. A differentiation is made between cavity scabbing, i.e. scabs occurring at the upper horizontal mold wall, and bottom scabbing, which occurs below the casting metal flow at the mold bottom. Veins are also caused by scaling, but unlike scabs they do not break open, but grow into the mold cavity as a consequence of quartz expansion, so that the casting metal flows into and fills the occurring gap to form a rib-like structure. Veining is very often observed in resin-bonded cores (commonly also referred to as scabs). The effect of heat (radiation, thermal conduction) from the casting metal causes a thermal expansion of the mold material. As a consequence, different temperatures in each mold zone cause considerable differences in tension. These tensions have an impact on the surface layers of the mold or the mold walls. Due to the quartzsand expansion, particularly as a consequence of the reversible quartz transformation at 573°C, compressive stresses arise in the surface layers of the mold which lead to scaling. Tensile stresses occur at the boundary layer between the highly heated shell and the relatively cool sand cod behind it, which have to be absorbed by the mold material in order to prevent detachment. The tensile strength of green sand molds (green sand casting), i.e. Wet tensile strength, determines whether swelling or detachment of a shell occurs and thus formation of veins, rat tails or scabs. for scabbing. 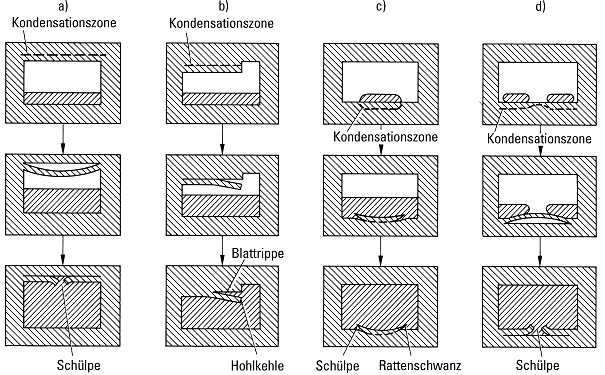 The deformability of the mold wall (mold material) and the adhesion to the subsurface, i.e. the extent of wet tensile strength in the mold material layers behind it, counteract the compressive stresses. If the mechanical-thermal stresses (tensions) exceed the deformability and strength in the strain cross-section, the defects shown schematically and described in Fig 3 occur. Cavity scabbing from the condensation zone occurs in the mold surface due to the compressive stresses arising there, which cause swelling and lifting of the mold wall (Fig. 3a). This process is generally referred to as scaling. Veins are also caused by scabbing (Fig. 3b), but without the shell breaking open so that a flash-like, raised scar becomes visible. This vein can be removed by increased finishing work in order to save the casting. Bottom scabbing occurs in the mold cavity below a casting metal flow and thus at the bottom of the mold. The cause here also originates from the condensation zone which causes scaling. If the sand shell remains connected to the bottom of the mold, either scabs or rat tails occur due to the raised shell edges (Fig. 3c). 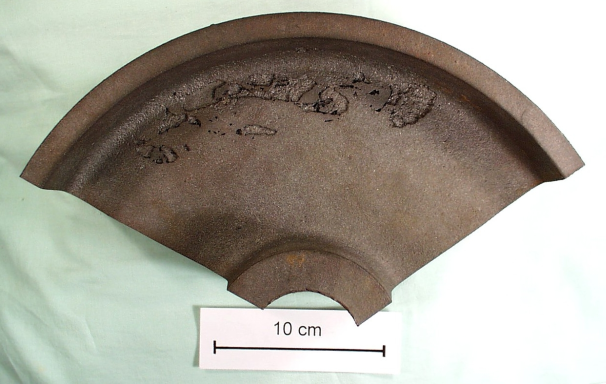 If, however, the sand shell swells and breaks apart under the load of the metal flowing above it, typical bottom scabbing occurs at the casting bottom (Fig. 3d). 3. Reduction of the casting temperature and shortening of the casting time.